Every now and then our team is approached to take on projects a little outside the norm of our typical design processes. We were up for a challenge, especially since it involved a charming home in the historic Old West Austin. Old West Austin is known for its ‘storybook bungalows’ and serene neighborhoods that are just minutes away from the bustling Downtown Austin scene. However, the project had a few hurdles. Our clients were out of state. Our clients lived in California and contacted us a few weeks before making the big move to Texas. Therefore, all communication and decisions had to be done remotely through email and phone conversations. We had time constraints. Time by far was the biggest challenge. We had to cram our typical 14 week design process into a 2-week period so that the main areas of the home were completed once the family arrived to their new Austin home. That meant decisions had to be made quickly and we needed all in-stock items to meet our deadline. 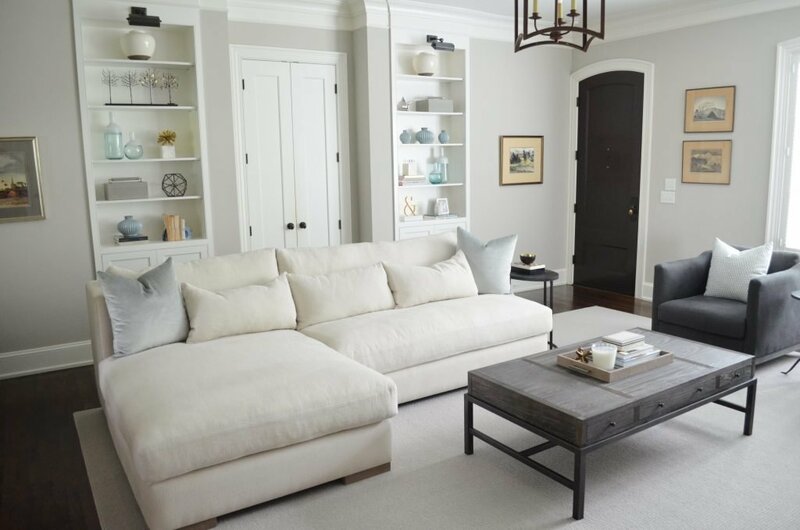 Even with these challenges, we wanted to be sure the home’s interiors were just as serene and cozy as the neighborhood that surrounds it. Thankfully, our design team works quickly and our retail shop had many items that fit the client’s tastes. 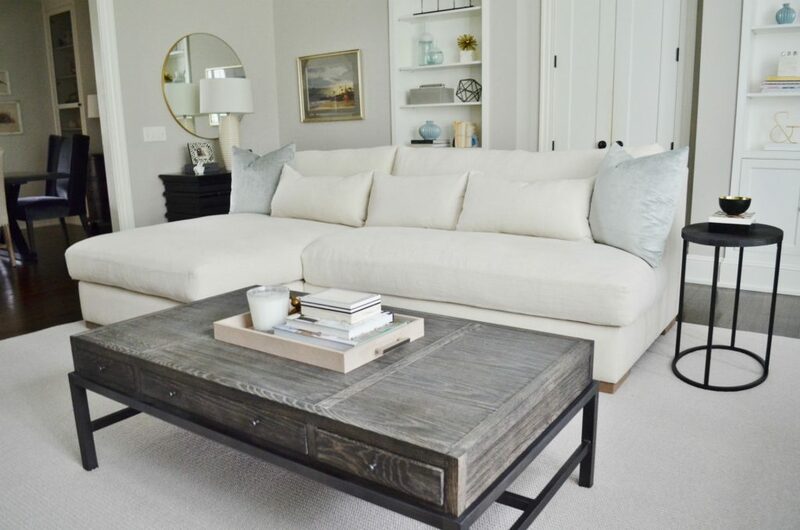 We brought in our ultra-deep Santa Barbara Sectional and Monterey Chairs for seating. 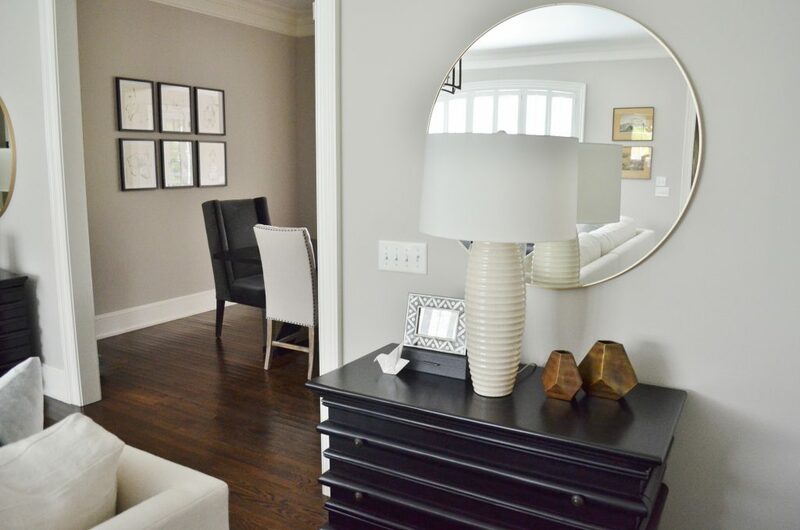 Dark bronze/iron accents were brought in with the coffee table and side tables to match the home’s existing fixtures. Dark casegoods and light upholstery give the space an effortless and collected feel. Gold and pale blue accents soften the contrast between the dark and light staples of the space. 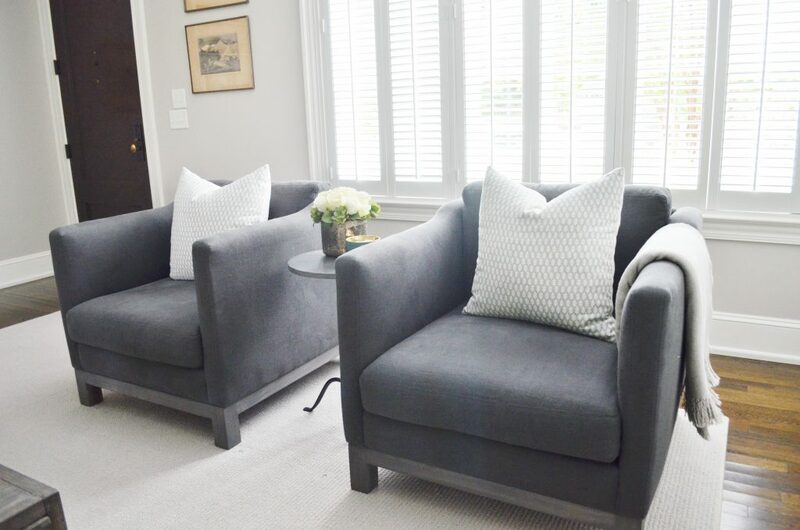 The charcoal linen fabric on the Monterey chairs also help play up the muted color story. 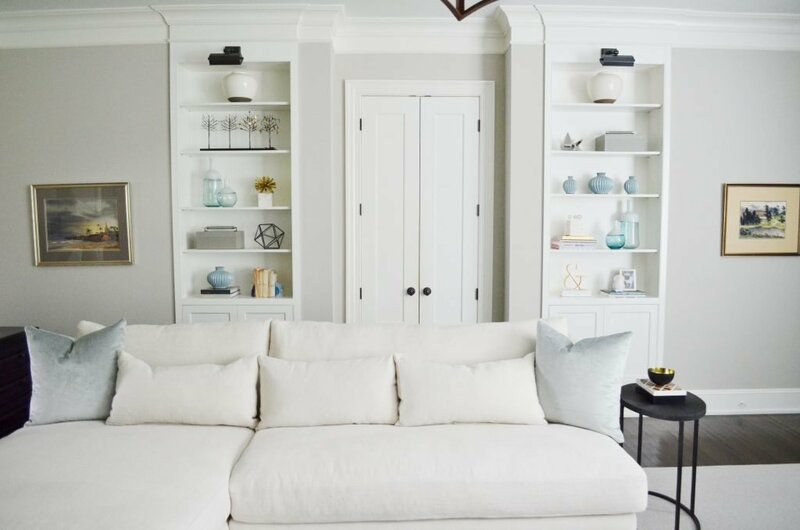 Pale blue printed pillows soften the frame and color of the large structured chairs. We styled the matching built-ins with a mix of blue, gold, and iron accessories. They add to the youthful feel of the space. Thin gold framed mirrors over dark-ribbed chests give even more transitional appeal to this bungalow home. The matching mirrors and chests frame the dining room entry in a modern, minimal way. Luckily, the main spaces were installed and ready to go just before the homeowners drove into town. What a nice treat for the homeowners to see finished spaces after a long drive! We are glad we could take some of the stress out of the moving process and make their house feel like home. If you are new to town, in the process of moving, or completely settled in, our design team can help you! Fill out our quick and easy design questionnaire to get the process started.